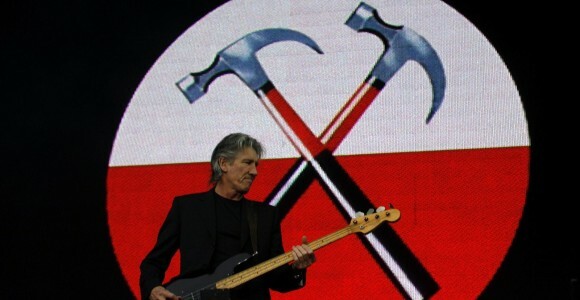 (from Billboard Magazine, December 3, 2013) Roger Waters, the 70-year old Pink Floyd co-founder, has used the Star of David as a symbol and used it for his support for a cultural boycott of Israel in his three-year world tour for “The Wall.” Now that his tour has ended, Roger Waters wants to set the story straight. This criticism he has received came from Jewish groups over the use of the Star of David. Waters said, “I worry about it every day. It’s a huge concern to me that I would be considered to be a bully.” He also commented that it was never in his intentions to offend the Jewish people. The whole debate began while the band was playing the song “Goodbye Blue Sky” and a fighter jet dropped an animated Star of David which is a symbol of Israel’s flag and appears on their flag. It was not the only symbol used that night; there was also a crucifix, crescent moon, and a United States dollar sign. Waters says, “‘Goodbye Blue Sky’ is all about and how I feel about the fields of the earth being bathed in blood because we’re so determined to bombard our fellow man with our bit of ideology, or our bit of this, or our religion, and some took issue with that.” He also took measures to try to appease some of the chaos over his use of these symbols by talking to the Anti-Defamation League national director Abraham Foxman; after they communicated Waters agreed to move the Star of David farther away from the U.S. dollar sign.